Update: Hah! I missed a post from Mark Thoma that also shows that Greeks work more hours than Germans, a LOT more. This entry was posted in Banking industry, Credit markets, Currencies, Dubious statistics, Economic fundamentals, Macroeconomic policy, Politics on May 16, 2010 by Yves Smith. So, one less reason for Germans sending money to Greece? So what? Projected household income in Germany is expected to grow more than household income in Greece, and broadly speaking, the German economy is not usually thought of as being based on internal consumption (i.e. consumer debt would not be as key to support future growth as it might be in the US). 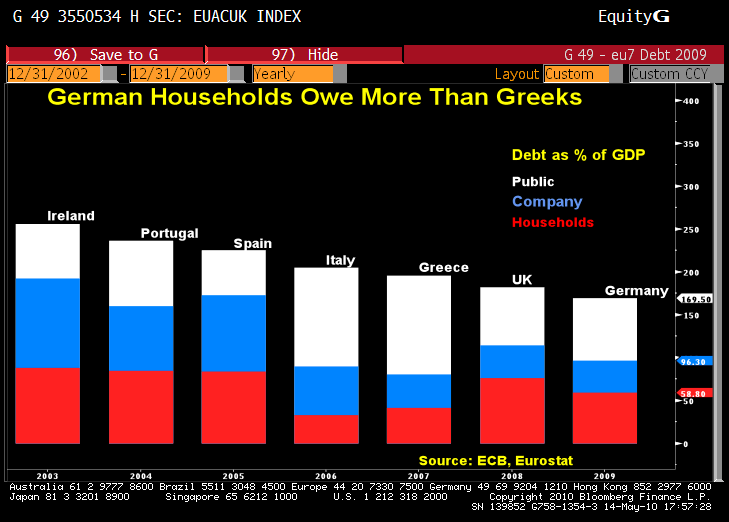 I’d love to see a break down of German household debt and the country the assets backing it were based in. Theory- German vacation homes in the PIIGS. There are probably a fair amount of Germans who avoid paying taxes in Greece too. Another country that is thought of as relatively clean on the debt front, Canada, also has households that are deep in debt. If the exporters, the very countries we want to consume more to promote rebalancing in our deeply dysfunctional world, have deep debts in their household sectors, how can they possibly be expected to pick up consumption even as export-driven income falls off? This just looks more and more intractable. Not only is it intractable, it’s also undesirable. Most of the consumption has been on disposable crap. To say that this must continue in order to meet some arbitrarily-set GDP target is ludicrous. But the disposable crap is profitable…clean drinking water, not so. This is the system we’re in, at the moment. I agree–so let the current system collapse under its own weight (which it is currently doing in any case). There’s certainly no need to feed it. The Canadian survey commissioned by the CGA (CGA is a poor cousin of CPA or in Canada a CA)- See page 89 for methodology. It is important to note that this was an online “Public Opinion Survey” as opposed to an analysis of data from the financial sector. Add to that the black economies in the Club Meds plus the cash the individuals in those countries have stashed away. France does not appear on the chart but should be somewhere between Italy and Spain as I remember. This however, is quite big in Germany as well. The money, both in cash at home as well as in Switzerland, Luxembourg and even Austria is substantial. Italy, Greece and perhaps Spain may have a bigger black market, but e.g. the French and UK ones are likely smaller. (Un)fortunately it is very difficult for gov’ts to get that money. Plus the distribution of it is very uneven in the society, so most likely the people, who are in debt, don’t have black money. Poor people might earn money on the black market, too, but are very likely to spend it directly. Hmm – does household debt include mortgages? Or the cost of doing things which have become quite common, at least in the region I live in, such as installing a PV roof system (costs say 30,000 euro upfront, with an expected payback time of less than 5 years – I could ask several neighbors, or several of the people involved in installing/financing such projects) or replacing an uninsulated roof with a new one. Debt to finance consumption is the current American version of productive economic activity. Germans tend to be much more old fashioned – they often use debt with the idea that return on investment in real terms is a good deal. Such as those PV installations, or the solar hot water systems, or three pane energy saving windows …. PV installations are heavily subsidized in Germany. Without such, even $200 oil and shutdown of all nuclear power plants will likely never give you a positive ROI. Solar hot water is a very reasonable approach, if you have enough space for the water tanks storing the heat, but in best case need more than a decade to break even. 3 pane windows will often yield little energy savings at high cost, as virtually every window in Germany is dual pane already. Warning, the link listed above has a bad reputation. Would someone economically inclined please comment on the ridiculous graph purporting to demonstrate that Greeks work more than Germans. Summing up hours worked per year is hardly comparing apples to apples. By the Mark Thoma chart, if I worked in a country with a 100 work week, but coudl retire after 1 year with a full pension for the ret f my life, I would be listed as the hardest working nation. You need to look at lifetime work normalized to the expected pension payout to determine differerences in work between countries. It’s the dirty secret of this conflict, isn’t it? The rich blame the poor for their poverty, and insist that the poor must…pay more & work harder! We really are peasants and haven’t advanced one bit. Of course a majority of Germans probably go for the bait, as it’s flattering as a nation and as a people to believe one and his group are so virtuous. The same sort of propaganda works in the US, as the Texas schoolbook debate amply demonstrates. Thanks again, DS, for vital insights. The Greeks are as lazy as illegal meskins? hoocoodanode? The data is unreliable. What kind of nitwit would draw a strong inference from this data? It probably make sense in an MMT perspective. The Piigs is weighted down by its current account deficit, in the countries that have better adhered to Euros S&G pact household and Companies is in larger debt, in countries with an more lax attitude to S&G especially Household debt is lower. In a country like Germany who squeeze the domestic market to by force create a external surplus household is in more debt, albeit the external surplus make up for domestic austerity it primarily benefit the company side of the private sector, primarily export sector. In a modern (export) industry nation there is high level of productivity growth, they produce more and more with less and less employees, export growth will not alleviate unemployment. In addition, with declining employment despite growth in production less of the external gains will be spread out and spur domestic growth. In fact there is a serious conflict of interest between the export sector and the domestic economy, a flourishing domestic economy imply raising costs and import and where it is appropriate maybe a stronger currency. I suspect that Italy and Greece come out the way they do because the above chart does not account for the underground economy. Nobody pays taxes in these countries. I doubt that anyone has decent data on the personal incomes and debts in these two countries. One reason for Greeks having less debt than Germans is the large black market/cash economy in Greece. Nobody wants to pay taxes to a government the view as corrupt, so a large portion of the society pays each other in cash. People dodging taxes are less likely to take on debt as it provides a paper trail of their financial standing. Debt/GDP is a poor measure of a country’s ability to service debt. Trade-able tangible goods: manufactured products, minerals, or agricultural goods, as well as a positive trade account define a country with the ability to make money and service its debt. Germany is such a country. In contrast, there are many countries where government expenditures define a high fraction of all economic activity. Greece is such a country, with about 40% of GDP by government, and a current account deficit at about 12% of GDP. Question is it part of the creaking welfare system that has led to the high taxes and restriction of personal income at least for much of the working middle class, those without recourse to tax havens. There’s a reason why some germans have been leaving their homeland- they don’t want that burden that looks set to grow. Hey, I found your blog while searching online your publish looks quite exciting for me. I’ll add a backlink and bookmark your internet site. Preserve up the good work! I’m from Greece. I’m an electrical engineer with 2 MSc degrees in Telecom field and 13 years working expirience. My yearly salary is 48.000 euro. From this ammount, approx 10.500 euros go for the public pension and healthcare system. The company I’m working for also pays another 18.000 approx for the same. For taxation 8.000 euros. From 48.000 I’m getting on hand 30.000 approx per year. I’m very well paid for Greece. I’ve a 3 years old child. When we are visiting a doctor, I’m paying 60-70 euros for the doctor service and then I’m receiving after a month from the public healthcare system 15-20 euros. I’ve to work until I become 65 years old and without stop (at least 35 working years). The pension will be 65% of my average salary. If I stay without job, I’ve to pay 320 euros per month to keep the public healthcare live. The unemployment benefit is approx 500 euros per month for a maximum duration of 12 months. My wife (also an engineer) had to go back to work while our child become 2 months old. The other option was to stay at home for another 2 months, but without salary. Please note that all the above are valid since long time ago. The new changes might make things worst. I think the picture you have from the TV for greek workers is not the real.